If you’re anything like me, mornings can often be rushed. Even with the very best of intentions, time can slip away. Sometimes, before I know it, I have to rush out the door, and I may or may not have eaten. We all know how important starting your day off with good nutrition is, so this lack of food can be problematic. Having healthy options on hand is so very helpful. I often make double-sized portions of our evening meals so that we have ready leftovers. I also often make smoothies in the morning so that I can cover my “nutrition bases” in a hurry. For those days when I just don’t feel like a having a smoothie, it’s nice to have other quick options on hand. 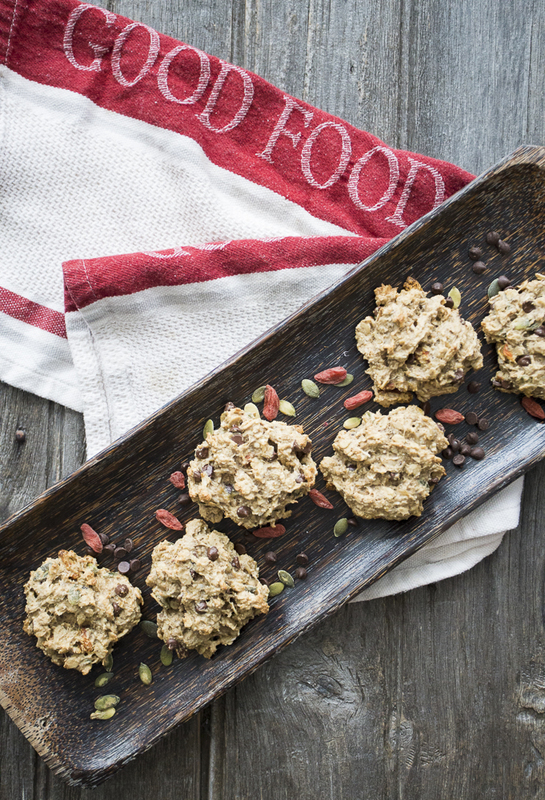 If you’re the same, when you’re looking for something else to have, you may wish to give these breakfast cookies a try. The basis of this recipe is heavily borrowed from one of my favourite cookbook authors, Dana of The Minimalist Baker. Using her base, I added goji berries, pumpkin seeds and coconut for added flavour, fibre, texture and nutrition. I also elected to use cashews instead of almonds and cashew butter instead of peanut butter, primarily because that’s what I had available, but I also enjoy the subtle flavour of cashews. Cashews are also easier to make into a “meal” with your blender or food processor because they’re softer. The egg substitute was made with ground chia seeds. This is an excellent option and easy to make. Simply grind the chia seeds and add water. Let the mixture sit for about 5 minutes before using to allow it to thicken. You can also use ground flax seeds. I have made “chia eggs” without first grinding the seeds, but I prefer the texture and consistency when the seeds are ground and think it yields a superior result. Either way, it’s a fibre-rich alternative to eggs. Combine mashed bananas, chia eggs, cashew butter, oil, vanilla and maple syrup. 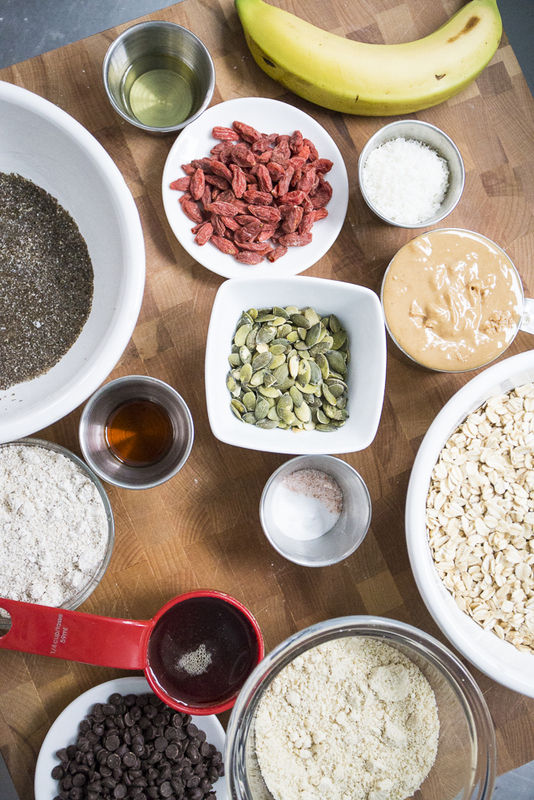 In separate bowl, combine dry ingredients. Add dry ingredients to banana mixture. Add pumpkin seeds, goji berries and chocolate chips. Drop spoonfuls onto parchment-lined baking sheet. Bake for 15 – 17 minutes in 350 degree oven. Makes about 2 dozen cookies. Enjoy!